I am on the road this week on a media tour, but I wanted to share a few more yummy recipes for Rosh Hashanah before the holiday. 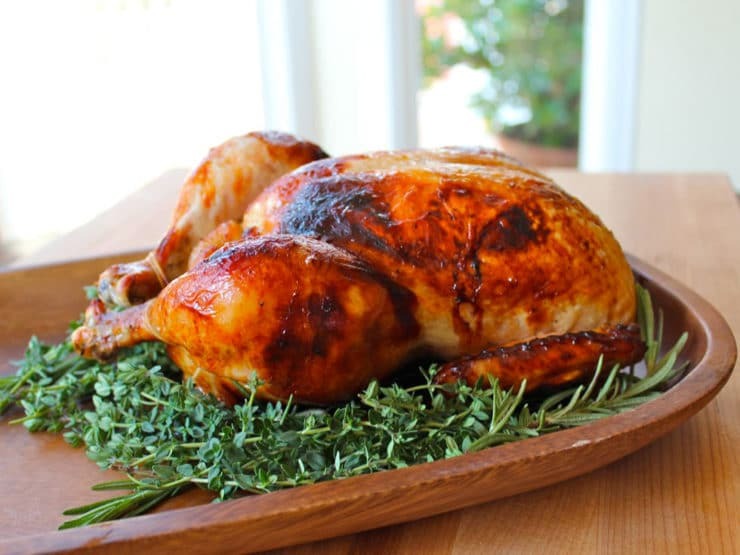 Today’s recipe is my Honey Herb Roasted Chicken. This super juicy, flavorful chicken is drizzled with honey white wine sauce for extra flavor and aroma. It’s a great option for those who want a lighter entree, or a change from brisket, or simply another menu choice for the holiday meal! Roast chicken is so comforting, and a whole roast chicken can be an impressive addition to the holiday table. 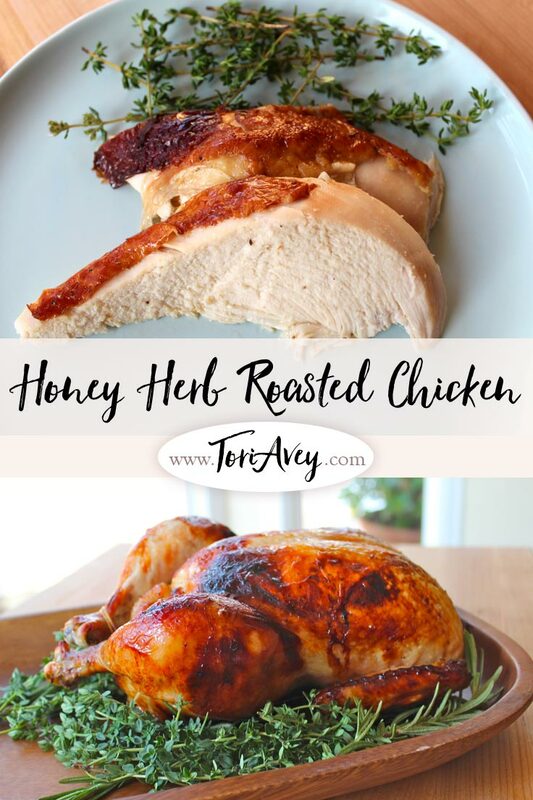 When thinking about my Rosh Hashanah menu this year, I wanted to create a simple roast chicken with the essence of herbs and honey– not overly sweet, but full of flavor. I made it four times before I felt like it was perfect (which means my family ate a lot of chicken earlier this month)! Finally I hit upon the perfect balance of flavors. This recipe is the result. It received thumbs up all around from my family… and they’re my toughest critics! 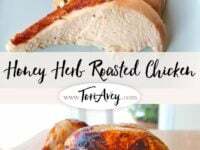 Honey Herb Roasted Chicken - juicy roast chicken with herb honey and white wine sauce. Kosher, Meat, Rosh Hashanah, Passover, Gluten Free. Preheat oven to 400 degrees. 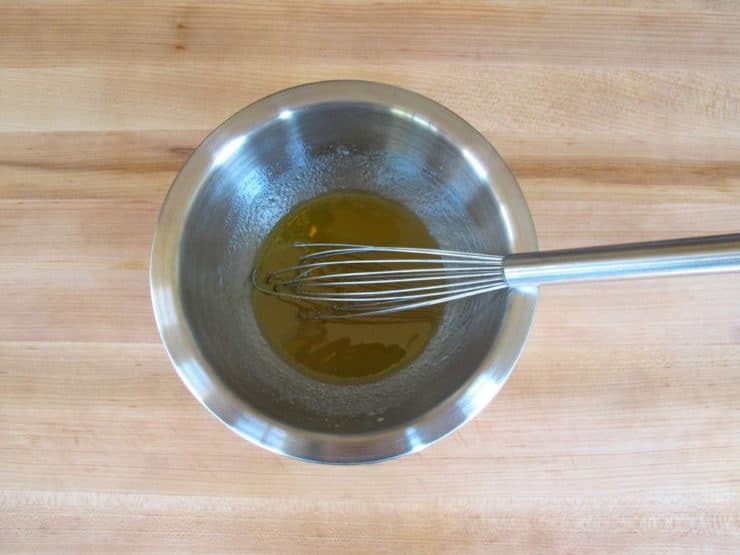 Whisk together ¼ cup of olive oil, 1 tbsp of honey, and 1 tbsp fresh lemon juice. This is your basting mixture. 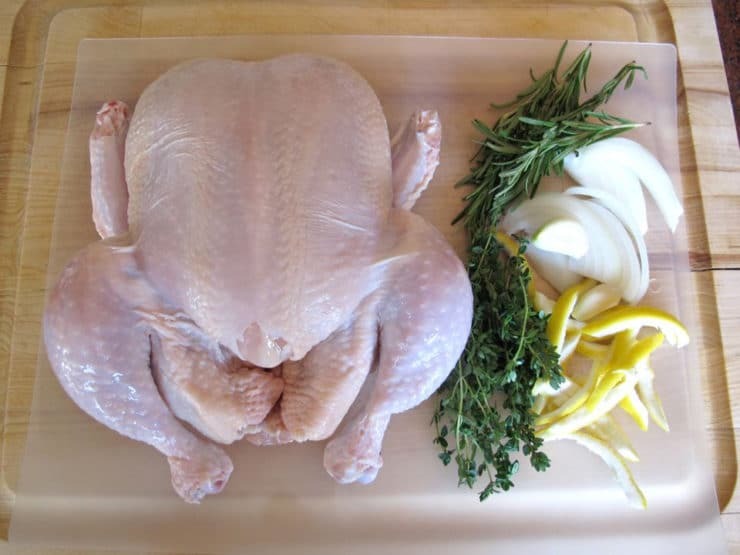 Assemble your chicken, herbs, lemon peel, garlic, and a few small slices of onion. Season the cavity of the chicken with salt and pepper and brush some of the basting mixture inside the chicken (go light on the salt if you're using a kosher chicken, which will already be salted). Stuff the cavity with half of the fresh rosemary and thyme sprigs, sliced lemon peel, garlic cloves, and a few pieces of the sliced onion. Don’t overstuff the cavity; pack it loosely with room to breathe. Truss the chicken; click here for instructions. Season the chicken with salt and pepper. Line the bottom of your roasting pan with foil. 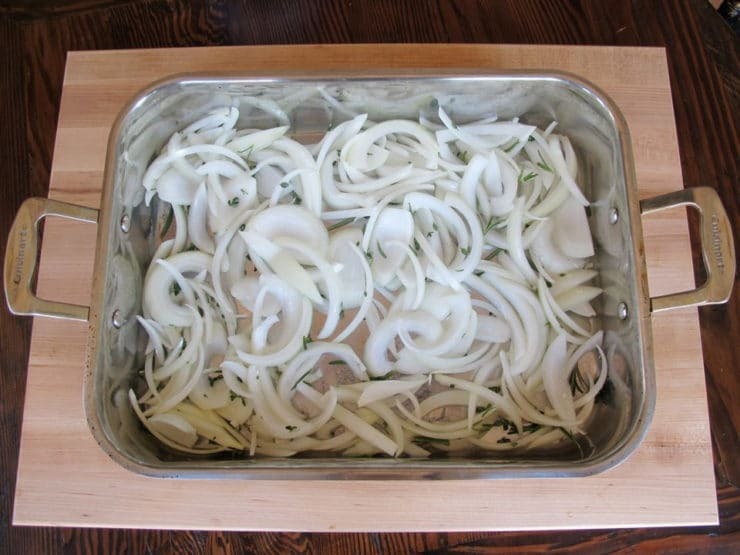 Take remaining sliced onions and place them in an even layer on the bottom of your roasting pan. Drizzle 2 tbsp of olive oil over the onions. Remove leaves from the rest of the rosemary and thyme sprigs, then put the leaves into the roasting pan and discard stems. Use a large spoon to toss and coat the onion slices with herbs and olive oil. Place the chicken breast side down onto the bed of onions. Pour half of the basting mixture over the chicken, using a brush to coat it evenly. Cover the roasting pan with foil (nonstick foil is best). Pierce a few small vents into the outer edges of the foil with a knife. Place covered roasting pan into the preheated oven and cook for 45 minutes. Take roasting pan out of the oven, remove the foil (reserve), and flip the chicken to breast side up. 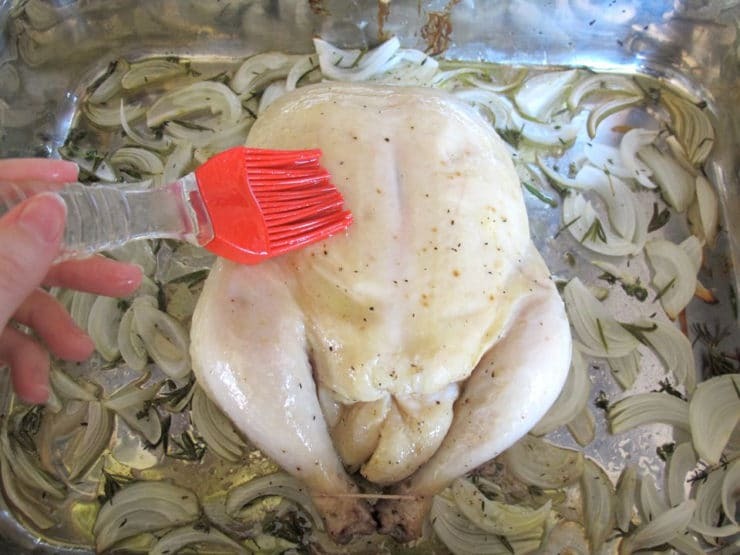 Brush off any onions or herbs that cling to the top of the chicken. Brush the rest of the basting mixture evenly onto the top of the chicken. Cover the roasting pan again with the vented foil. Place back into the oven for 45 minutes longer. 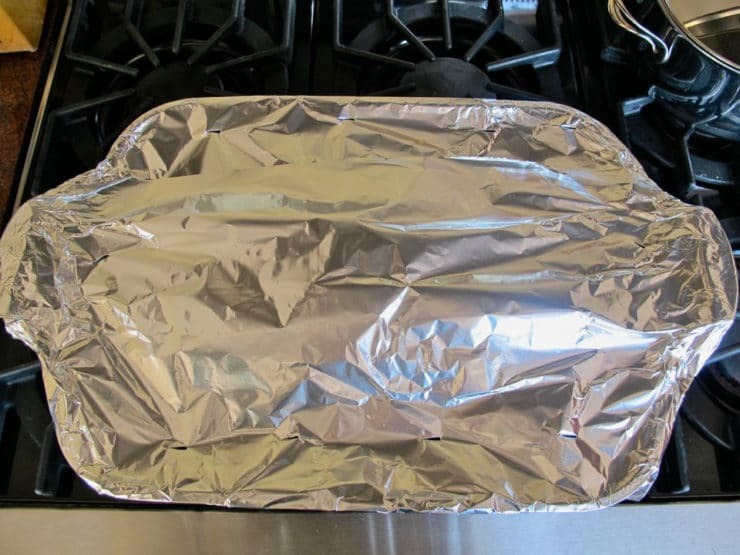 Remove foil from the top of the roasting pan and reduce oven heat to 375 degrees. Let the chicken continue to roast another 20-30 minutes until the skin is brown and crisp. The skin may get quite dark in places; this is from the honey in the basting liquid. Watch the chicken carefully, as it can go from brown to black very quickly. Blackened parts of the skin will not affect the flavor in a negative way. 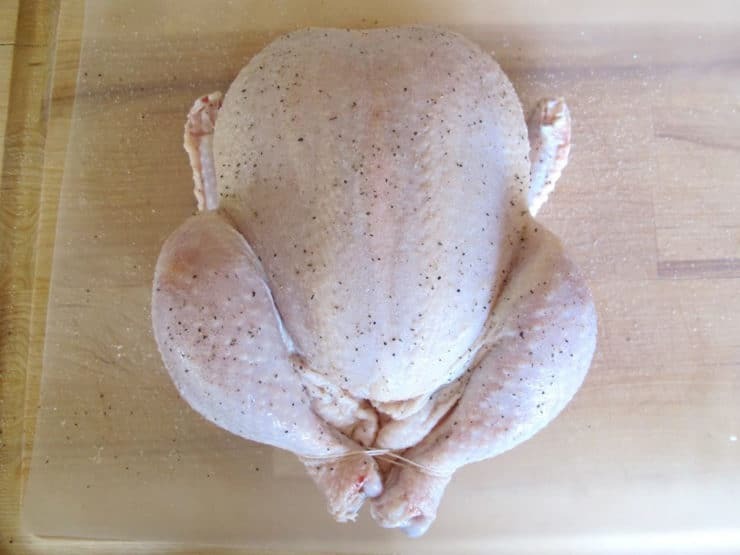 Chicken is done when the skin is nicely browned, and the internal temperature reaches at least 170 degrees F as measured on a food thermometer at the thickest part of the thigh. 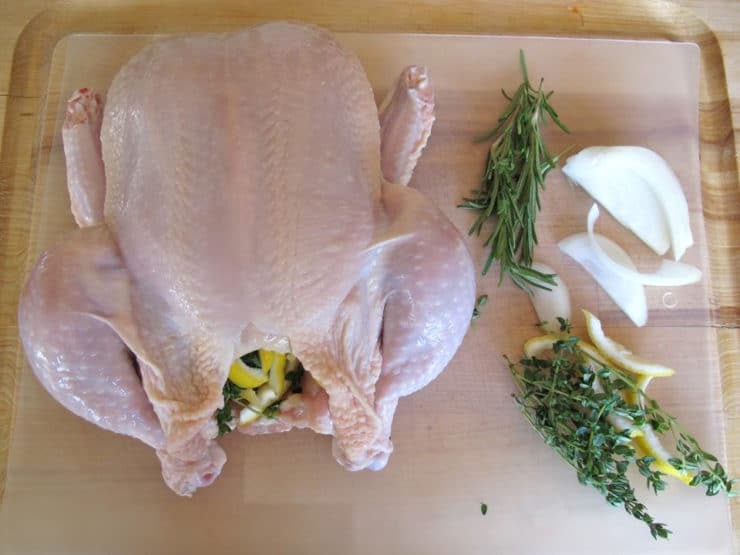 Take the chicken out of the roasting pan and place it on a carving board. Cover it with foil to keep the heat in and let it rest for 15 minutes before carving. 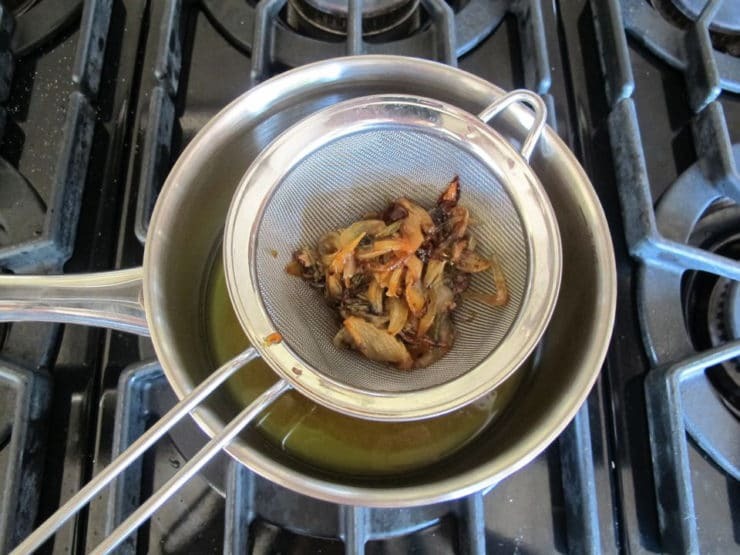 Meanwhile, use a mesh strainer to strain the pan drippings from the roasting pan into a small saucepan. 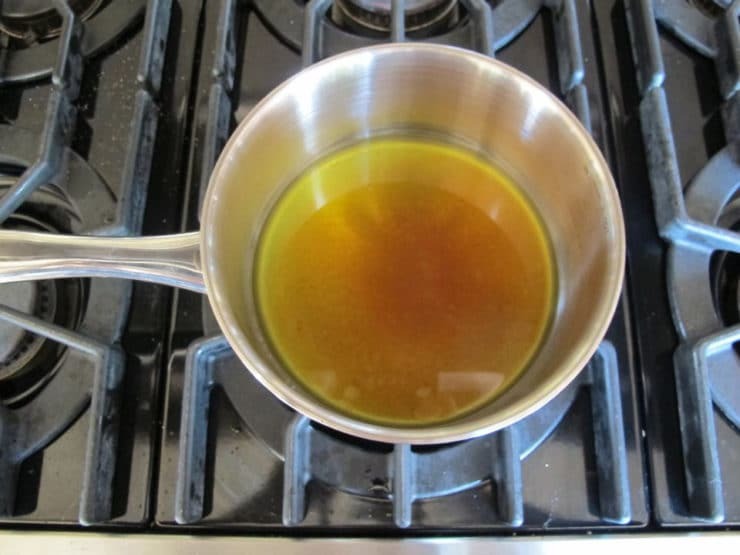 Let the drippings settle for a moment; you will see brown bits settle to the bottom of the pan and lighter fat and oil rise to the top. Skim about half of the fat/oil from the top of the liquid. 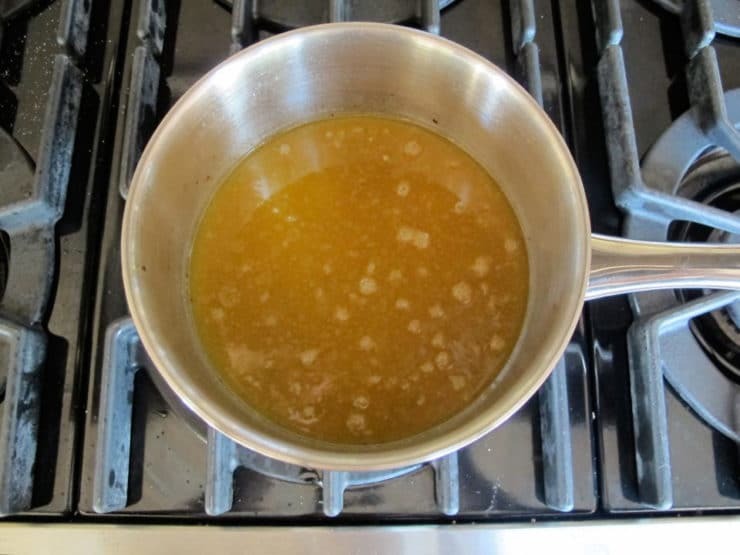 Add ½ cup of white wine, ¼ cup of chicken broth, and 2 tbsp of honey to the pan. Whisk to blend. Heat the sauce over medium to a light boil and let it simmer for about 2 minutes, whisking constantly. Remove the honey sauce from heat and season with salt and pepper to taste. Carve the chicken. Drizzled each serving of meat with some of the honey sauce. Garnish with fresh thyme or rosemary, if desired, for a pretty and aromatic presentation. This was such a great recipe! The aroma was fantastic! The only thing that was different when I made it was that there was not as many drippings but I was using a family butchered chicken with all of the skin removed so that could account for less drippings! I will definitely be sharing this recipe and making it again! I made this last year for Rosh Hashanah, and plan to do so again, because it was so delicious. 🙂 I’d like to make two chickens so I have enough for a larger crowd- are there any directions for roasting two at once? Do I need to change the temperature or roasting time? Thanks for your help! Hi Gretchen, it will likely take a bit longer to roast two at a time, but I can’t give you a specific time difference. I wouldn’t change the cooking temperature, but I would switch the chicken’s positions halfway through roasting to make sure they each get the same amount of heat exposure (heat tends to be different throughout the oven). 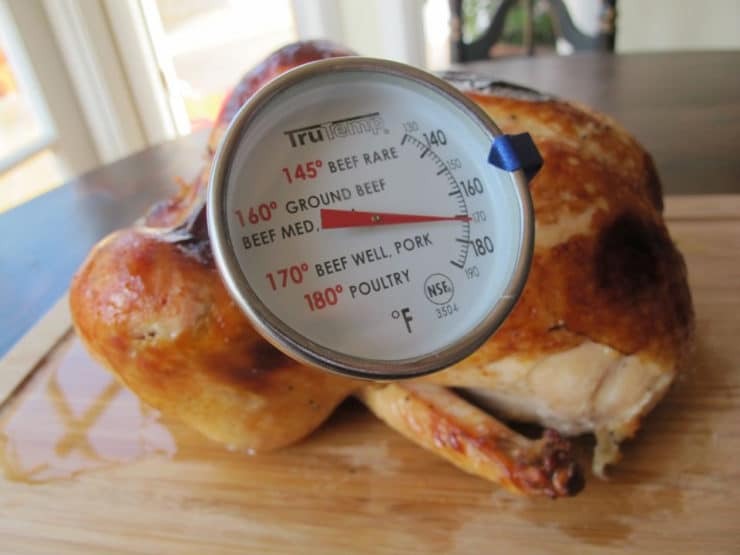 Best way to test for doneness is with a meat thermometer, that way you’re not left guessing if it’s cooked through or not. Enjoy! I moved to Israel and a lot of Israeli kitchens only have hot plates and toaster ovens. I just made this in my toaster oven and it came out delicious and super moist (and cooked very well which I was worried about; I had to cook it for about 20 minutes longer to brown). I would love to see some more toaster oven/hot plate friendly recipes. Its hard to cook here sometimes. This was my family’s first time celebrating Rosh Hashanah and I have to tell you that this is the best roasted chicken that I have ever made (thanks to you!). We have made it several times since then and it always comes out delicious. Fabulous Jen! Love hearing that. This. Was. Amazing. !!! Roasted chicken is always a bit of a challenge for me- it usually turns out well, but I’m never left with any drippings. This cooked up beautifully, and even without a lot of drippings, the honey wine sauce was delectable. The meat was falling off the bone, it was so moist. Thank you! Awesome! So pleased it turned out well for you. I feel most comfortable when I am able to complete much of a recipe preparation well ahead of serving time. This is why brisket works so well in my house, since I often make it the day before, and it is even better after soaking in the juices before reheating. 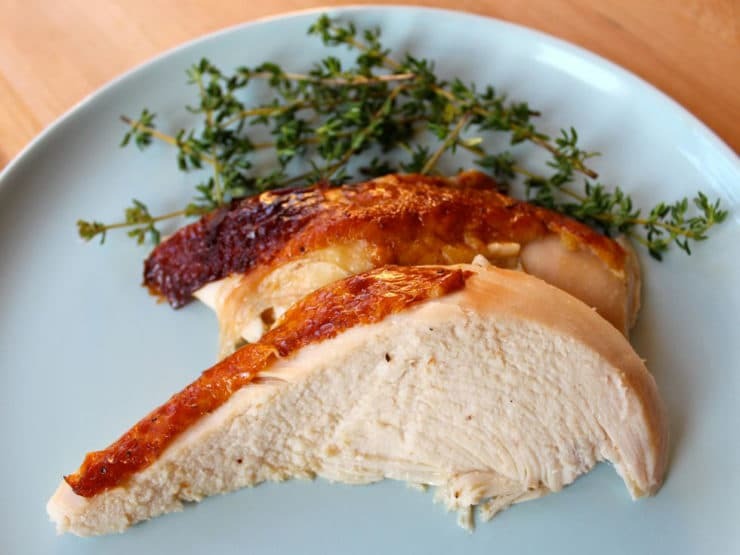 But this year I would like to make chicken for Rosh Hashanah and this recipe looks so delicious. Is there any way this could be made the day before without ruining it? Or perhaps even several hours before serving, could I complete all steps through the carving of the chicken, arrange it in an oven safe tray with the honey sauce spread over the parts, and then reheat it in time for serving? Also, if two chickens are roasted, am I correct to assume that doubling the recipe amounts will be adequate and the time/temperature in the oven will remain the same? Thanks again,Tori, for so many wonderful recipes that I have tried from your website and for your patient responses to my questions! Because this other recipe uses chicken pieces on the bone, it can easily be made in advance and will retain a lot of its flavor and moisture when reheated. What I would do is marinate the chicken overnight, pop it in the oven on the morning you plan to serve it, and roast till done. Keep it on the counter covered in foil till it cools to room temperature. Keep it in the refrigerator in its original roasting dish covered with foil. About 45 minutes before you’re ready to serve, pour a little chicken broth in the bottom of the roasting dish, then reheat it in the oven (covered) at 325 degrees till warmed through. Make the sauce just before serving. Or, you can make the sauce ahead too, but know that it will thicken when it cools and you may need to add additional chicken broth/white white when you reheat the sauce in order to thin it out to the desired consistency. Good luck! this is simply the best chicken I ever made. I made the Herb Roasted Chicken for Rosh Hashanah this year–actually made 2 birds, doubling the recipe to feed 12. Instead of my needing to apologize for a dry, tasteless bird, my family and friends thought this was the best chicken they’d ever had–so moist and flavorful. Even the leftovers for dinner day 2 were delish. Wow! This one’s a keeper. Thanks for all the wonderful recipes and great information. I just love it! I’m so happy to hear that, Elyse! Thanks for the feedback. Hi Yvonne, you could substitute sherry– or, if you’re avoiding alcohol, use an equivalent amount of chicken broth. Living in Switzerland I wonder what 400F would be in Celsius? Is it possible to put the bird in a claypot with claylid instead of covering with foil? Good job from Hagai Strohweiss to remind me on checking on your website since we talked a lot about it on our Pessach dinner last year at the DAN – you remember? Quite enjoyable! Do you think the chicken would turn out even more moist if marinated overnight in the basting liquid? My experience with chicken has shown me that marinating ALWAYS helps! My husband made this tonight for our seder, and it was delicious! Thanks for the yummy recipe. Just when I think there is nothing new I can learn about baking chicken you post your recipe. This is really great. I will definitely try it. Love the bed of onions! I’m part of your non Jewish blog followers but glad you don’t mind my appreciation for your amazing cooking. Another winner…. Hi Tori, I’m from Canada. A friend introduced me to your blog. This sounds great! 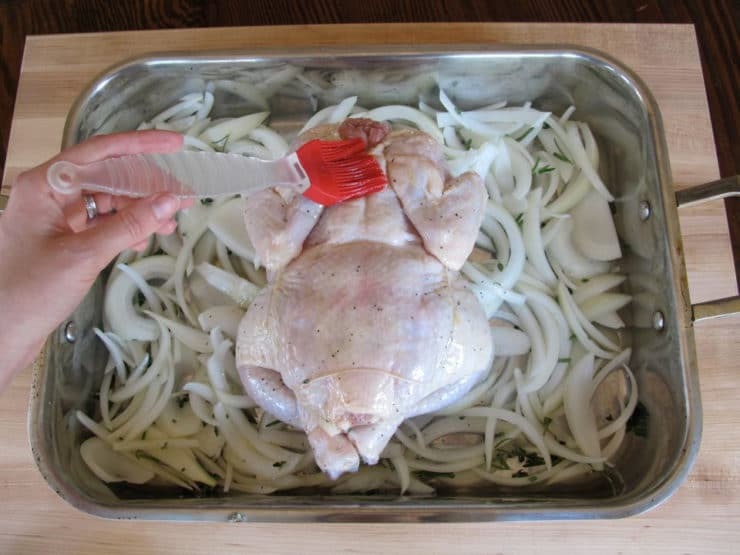 Does roasting the chicken on top of onions keep the bottom half of skin from getting soggy? Hi Brittany– it helps, but doesn’t eliminate that issue completely. The best way to avoid that problem is to roast the chicken on a rack in the pan, so there is no direct contact with the pan and the chicken. I made this for Rosh Hashanah, using bone-in chicken breasts. Soooo good! And it does work well with “parts”, just have to adjust the cooking time. That final picture of the sliced chicken looks PERFECT. Beautiful, wonderful! I will be making this. Great recipe! Hubby and I loved it, and the kids were able to peel off the skin (LOL.) One thing I would change: skim all the fat from the pan juices. Pre-mix the honey, wine, etc, and add a teaspoon or so of cornstarch, arrowroot, or whatever, to thicken; dissolve completely. Then add to the pan juices, bring to a quick boil, and serve. This just thickens it up enough. Otherwise, the sauce tended to just run off the chicken. VERY tasty, though! Nice ideas Molly! I prefer the sauce thinner, but for a more gravy-like consistency this is a great way to go. Glad you enjoyed the chicken! It is indeed time to roast a delicious chicken! This one has me salivating! That is the prettiest roasted chicken I have ever seen!! This chicken sounds so so delicious and flavorful! I might need to use this recipe when I finally decide to roast my own chicken! OK, I’ve never made my own roasted chicken and after seeing this, I need to make it and I think I need to use this recipe! Your chicken looks so tender and delicious! This is a great recipe! My father doesn’t care for chicken, so we never had it a home…it was my first (and still favorite) “formal” dish. There is something so tasty and elegant about a roasted chicken…and it’s such an easy dish to make! I really like the addition of honey on this and roasting on a bed of onions. Best of luck with your trip…I hope it’s successful and fun! I love roasted chicken…this is so beautiful and elegant looking! do you think this would work well with chicken pieces, instead of a whole chicken? My family likes that a little better, and I’m much more successful with it too! What a beautiful bird, lady! It looks so scrumptious, Tori, and the honey wine sauce at the end! Ahhhh! I’ll definitely be trying it out 🙂 Have fun on your media tour!